And so to the Grand Finale. Needless to say, this was quite the party, with 600 guests starting the evening with the scrumptious canapés provided by last year’s Champion, Chef Lorenzo Loseto of George in Toronto. Everyone admired the amazing new BMW that would belong to the chef who wins (a two-year lease) and later they rocked to the music of Barney Bentall, Spirit of the West frontmen Geoffrey Kelly and John Mann, and guitarist Matthew Harder, literally leaping to their feet and dancing in the aisles when the guys played Home for a Rest. The emcee was Olympic gold and silver medallist Jennifer Heil, one of 12 Olympians present, and she reminded everyone that, to date, Gold Medal Plates has raised over $9.5 million for Canada’s Olympic athletes. That night, of course, the chefs were the athletes and they had their own medals to strive for. It’s hard to create your masterpiece for 600 when you only have about four hours to prepare. The chefs all did a lot of preparation in their home towns and shipped components and elements ahead. Every one (except Chef Eligh) did more or less the same dish that had brought them victory in their regional competitions. 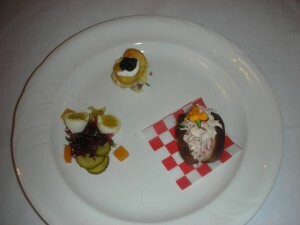 Which meant the judges were presented with some splendid and highly original treats. I called for them in an order that, on paper at least, would take us from the lightest dish to the heaviest. We began with Chef Lavallée’s dish, a “Nova Scotia picnic” inspired by the beach picnics her grandmother used to make for her when she was a girl. “First eat the little green leaf,” instructed Chef. “It’s an oyster leaf and it tastes of the sun and the sea and oysters. Close your eyes and you’ll imagine you’re on a beach.” We did – and we did. The dish consisted of three elements. First, set on a tiny red-and-white-checked paper “picnic cloth” was a delicious little sandwich of lobster and snow crab meat in a light, truffle-scented mayonnaise inside a soft, buttery brioche bun, garnished with edible flower petals. There was a mound of finely-chopped, soft potato salad topped with a potato chip that served as a raft for a dab of crème fraîche and a spoonful of sturgeon caviar. The third element was a selection of different pickles of varying intensity and very distinct flavours – cubes of butternut squash, sweet bread-and-butter pickles, hanasunomata seaweed of various colours – and a perfectly cooked quail egg cut into two and seasoned with homemade celery salt. Chef Lavallée’s match was flawless – the fresh, summery semi-dry apple cider from Tideview in Nova Scotia’s Annapolis Valley. Chef O’Flynn brought in our second dish, a taste of Canada from coast to coast. 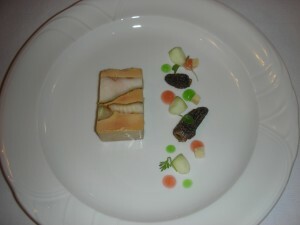 His dish was a thick and generous terrine of Alberta river sturgeon, pungently smoked with pine, and layered with perfect cured foie gras. The strata of colour were breathtakingly beautiful, the flavours rich and intense, challenging but ultimately so seductive. Decorating the plate and contributing much in terms of flavour were motes of Granny Smith apple jelly, dots of apple purée, minuscule crunchy dice of brioche and two plump, juicy morels reconstituted with a bathe in a fragrance of sherry vinegar, canola oil and bay leaf. Chef’s chosen wine – Sandhill Small Lots 2013 Viognier – had the weight and spicy fragrance to dance with the smoke and apple flavours of the dish. Chef Park presented next. He took the traditional ingredients of Korean bibimbap and re-expressed them with the finesse of Japanese cuisine as a complex roll of moussey chicken boudin, julienned vegetables, nine-hour-braised shiitake and cauliflower. Instead of sauce from a squeeze bottle, he turned the gochujang into a jellied skin as the outer layer of the roll. A tremblingly undercooked quail egg lay on top and scattered here and there was a crunchy assortment of five different kinds of puffed rice, for texture. Chef Park’s chosen wine had been lost by Air Canada en route to the competition so he had to scramble to find a substitute – Gehringer Bros. 2013 Riesling, a most successful compromise. Chef Eligh’s dish had a dramatic and avant-garde presentation – a perfectly smooth dome of crisp bread, as fine as lace, to be shattered into what lay beneath. There we found impeccably cooked, very subtly seasoned lobster and sablefish in a heavy, chowder-like sauce made from clam nectar and lobster reduction, thickened with butter and bacon fat and cradling soft morsels of carrot, celery and potato. The wine match was exceptional – Meyer Family 2012 Micro Cuvée Dhardonnay Old Main Road from the Okanagan. Next up was Chef Bohati with a complex and delectable combination of yellowfin tuna and foie gras. The foie was a large slice of cold-smoked torchon – marvellously rich and a clever contrast to the cool, soft slices of tuna carpaccio. 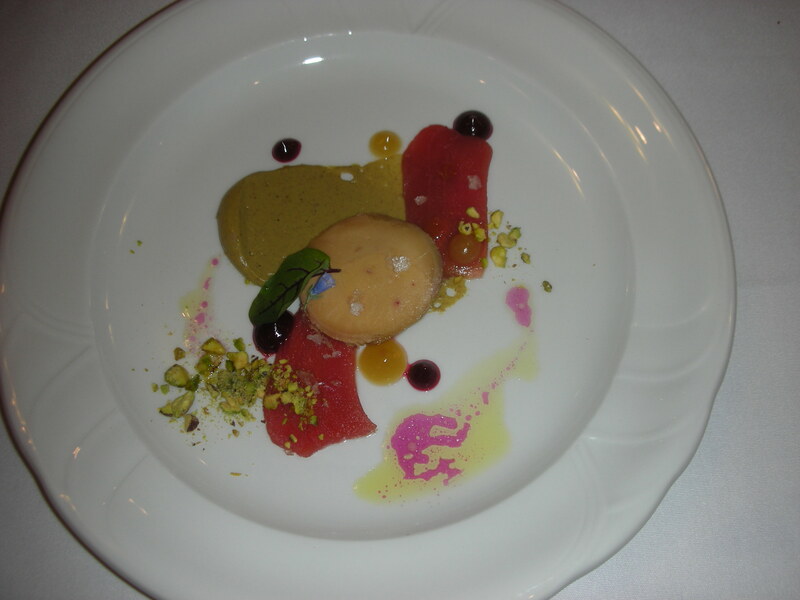 These two proteins were surrounded by a cluster of intensely flavourful little courtiers – preserved lemon and sorrel for sharpness; dots of red beet and pickled plum purée and other dots of yellow beet purée; a big khaki-coloured sauce made of pistachio and a braising liquid used for pork belly. Toasted pistachios were crumbled onto the plate and a warm vinaigrette touched with white truffle served as another sauce. Smoked salt and a blue oyster flower finished the dish. 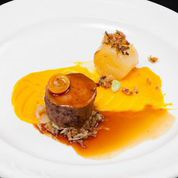 Chef Bohati’s match was brilliantly chosen – an off-dry blend of Riesling, Gewurztraminer and Pinot Blanc with plenty of weight, the Wild Goose 2013 Autumn Gold from the Okanagan. 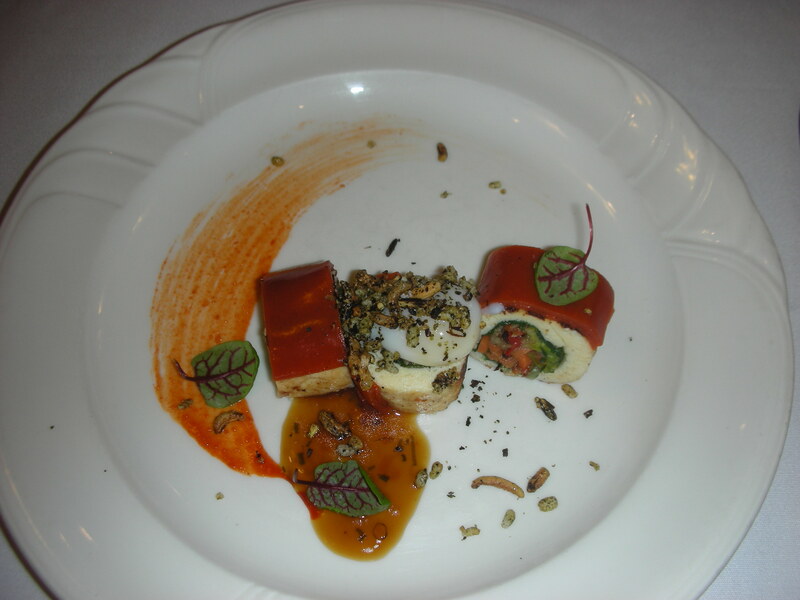 Chef Rebello reprised his avant-garde dish from the Regina GMP event, just two things on the plate, each of which needed to be consumed in a single bite. First, what looked like a tan-coloured puff perched on a rainbow-filled shot glass. 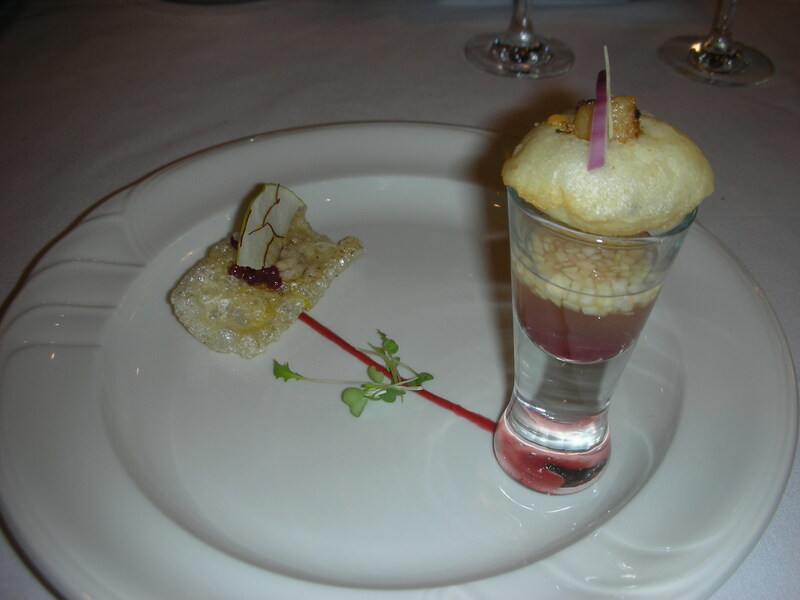 “Pop the puff into your mouth give it couple of chews then do the shooter,” chef instructed. The judges obeyed. 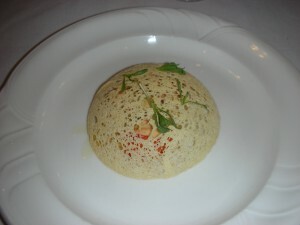 The puff was an air tuile made of semolina. Inside it were some flecks of chestnut that had been puréed and then deep fried, seasoned with lemon, chili, coriander and cumin. Also inside was a small finger of warm belly pork, nicely crusted. It was indeed a delightful mouthful, the spices spreading a warm glow across the palate. Then the shooter… Pow! Those spices began to glow as they were hit by salted lemon chili water, pickled apple and a dab of cranberry chutney. The second element took the same ingredients but used them in completely different ways. The pork was a crisp chicheron, the chestnut had become a dab of mousse, the cranberry chutney had been turned into pearls. The apple reappeared as dainty chips garnished with chili threads. It was similar but quite different – soft flavours, soothing almost, with the geaseless crunch of the chicheron. Chef’s wine match? Red Rooster’s 2013 Gewurztraminer. 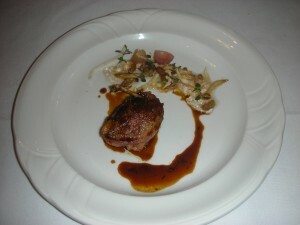 Chef Garland presented a little treatise on quail. The juicy roasted breast was stuffed with foie gras; the thigh had been poached in a master stock with soy and palm sugar (intense flavours) then Chef had pulled off the meat and turned it into a rugged-looking, panko-crusted croquette that several of the judges agreed was one of the most delicious things we had tasted all weekend. The stock, mixed with some of the chosen wine, had been reduced to a rich, sapid sauce. At the top of the plate was an enticing jumble of many effects – a gelée of peeled grapes and more Gewurztraminer, dainty cinnamon cap mushrooms, crunchy threads of fried shallot and fresh thyme that scented the entire dish. Chef’s wine match was inspired – Tawse 2013 Quarry Road Gewurztraminer, surprisingly ripe, rich and perfumed. Chef Horne’s dish drew gasps of admiration from the judges. He had taken bite-sized pieces of exceptionally tender, braised beef short rib and finished them with a glaze of tree syrups – birch, maple, cedar and sumac – that gave the meat a heavenly, sweet, woodsy crust. One piece of the short rib was served on a bare beef rib bone. Real maple leaves had been marinated in cider and then turned into edible crisps. Wild leeks had been transformed into a seasoning salt while others had been pickled, adding their own piquant alium flavour to the composition. What looked like a gleaming piece of bark was in fact deep-fried parsley root and more parsley root had been turned into a purée with parsnip. It was like a walk in the woods and notably well matched with Creekside 2012 Iconoclast Syrah from Niagara. Chef Jean built his dish around his chosen wine – Pelee Island’s 2012 Lighthouse Riesling. He marinated Manitoba pork tenderloin char-siu-style, cooked it sous-vide an then seared it with Asian barbecue spices for a touch of exotic heat. It was a beautiful piece of meat, nicely paired with sauerkraut that also had an Asian flavour, lightly spiced with star anise and chili. There was a potato confited in duck fat and topped with pork crackling, bacon and chives; squash purée provided rooty sweetness and a splash of colour. The sauce was a veal jus spiked with honey and lime and the final garnish was a flourish of candied kumquat, perched jauntily on the pork. Our penultimate pleasure was Chef Hill’s “Farmer’s Table,” a dish inspired by the Sunday dinners he enjoyed as a boy growing up on his parents’ farm in Saskatchewan. He cooked a gorgeous lamb sirloin sous vide then seared it in camolino oil. Beside this lay a ribbon of pliable lamb sausage. Peas had been turned into a purée and also turned into a wafer with the texture of nori. Celery root furnished a second purée and micro celery greens added more colour and graceful freshness; a tiny carrot looked as if it had been grown in a doll’s house. Pickled mustard seed with lots of lemon was a welcome condiment and yellow mustard flowers symbolized the fields of Saskatchewan. A spoonful of sour cherry reduction was made with fruit from Chef’s father’s farm. The presentation was stunning and the wine match spot on – McWatters Collection 2012 Meritage from the Okanagan valley. 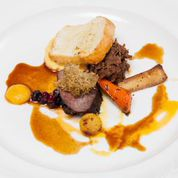 Chef McCrowe rounded off our evening with a splendid dish he called “Moose and Juice,” entering the judges’ room with a smoke gun to create the atmosphere of a Newfoundland forest – a little piece of theatre that was much appreciated. He had marinated the wild moose tenderloin with juniper then grilled it over charcoal with a dust of dehydrated chanterelles. 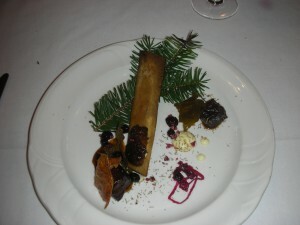 The moose shank was braised with molasses and red wine together with salt pork fat back and finished with a scattering of crispy scrunchions. A purée of turnip and sharp cheddar was a powerful component and spikes of other root vegetables were scattered around the plate. Deep-fried caribou moss added to the sylvan mood of the dish and the last element was a piece of “Nan’s toast” in memory of the moose stew his Nan used to make. The wine Chef chose was a super compliment to the food, Norman Hardie’s 2013 Zweigelt from Prince Edward County, tangy, fruity and light-bodied. The judges sat back. It had been a most memorable contest. Chef Park had aced the final round but all the marks for the Grand Finale were close – all within nine percentage points – a pattern that carried through to the final scores. We had known it was a very strong field going into the weekend and every chef had performed magnificently. At this level, their technical abilities can almost be taken for granted; what is exciting – as in the work of any great artist – is to see their unique and personal perspective emerge in the dishes they create before our very eyes. In the end, it was almost a photo finish – an Olympic sprint – and the winners of the gold, silver and bronze medals were less than two percentage points apart. 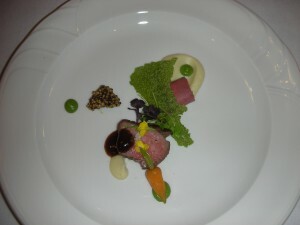 Chef Eligh from Hawksworth in Vancouver won the bronze. Chef Park from Park Restaurant in Montreal won the silver. 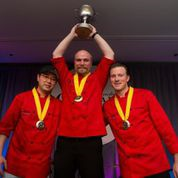 The gold medal went to Chef O’Flynn from the Westin, Edmonton. Huge congratulations to all the chefs – and their sous chefs – and the students from Okanagan College who served as their willing apprentices throughout the weekend. Heartfelt thankyous to the judges. A deep bow to our new champion, Chef Ryan O’Flynn.